When you think of beauty products, we’d bet BearMoo isn’t the first brand to come to mind. But all that is about to change after you’ve tried the company’s latest hair straightening brush. Starting with the design, everything checks out well here. The square head and black plastic design present a pretty nice look overall. And as far as accessibility goes, this iron is pretty easy to use with only the three typical buttons you’d expect to find on a straightener (plus, minus, power). Reading the temperature settings is pretty easy as well. The LED displays the temperature–which will flash until the temperature is reached. Really, we don’t see how this could be any easier. As a whole, the accessibility is pretty impressive when considering this straightener offers a whopping 5 different heat settings. And if that’s not impressive enough, these heats range optimally from 80 degrees to 230 degrees-Celsius. So we have absolutely zero doubts that you’ll find a heat perfect for your hair type. 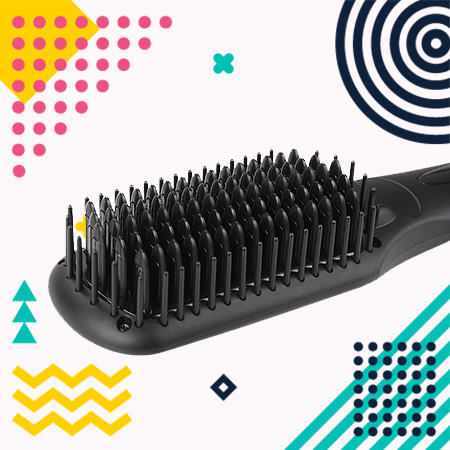 Furthermore, this brush will reach full temperature in a rapid 30 seconds, making this the perfect hair tool for those days you’re in a rush. Even the cooldown is pretty fast with a measly 10-minute wait. There’s even a nice anti-scald design to reduce burning. Overall, we had a hard time finding any faults with this ceramic hair straightening brush. If anything, We found the buttons to be pretty sensitive–and located exactly where our fingers gripped the brush. Also, we did notice this brush doesn’t smooth hair as well as others on our list. But that’s not to say this straightener is bad by any means (quite the contrary, actually). This simply means you might need to run the heated brush a few more times through your hair when compared to others. But when considering how well this straightener controls frizz and offers even heat distribution with MCH technology, it’s certainly worthwhile. Also, it’s worth noting that you will occasionally hear a hissing noise with this straightener. But keep in mind that all is fine–this is just the sound of the brush’s holes releasing hair-protecting anion. So this sound simply means your brush is working fine. And if anything actually does go wrong, you are protected with a 12-month guarantee. Amazing amount of heat settings. Doesn’t smooth as well as other straighteners you’ll find. All in all, the BearMoo Ionic Heated Straightener Brush truly provides an exceptional experience. 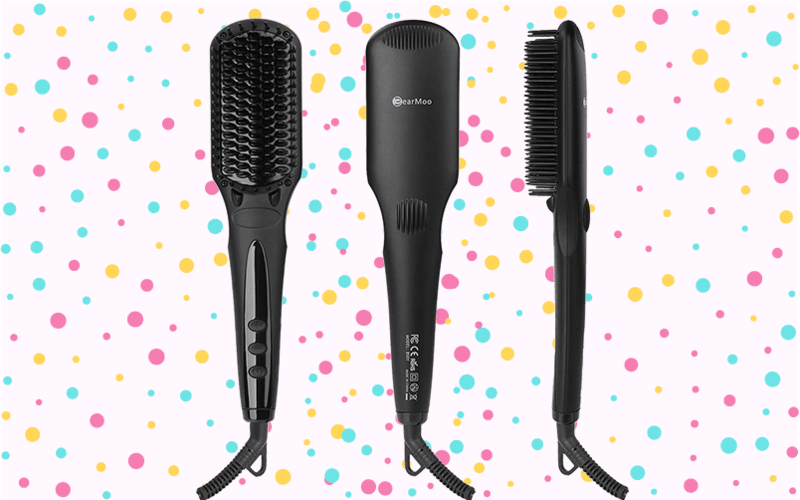 No other flattener on the market caters to every hair type quite like this brush. And it heats up pretty fast as well. Sure, you might need to run this through your hair multiple times for the perfect straightened style. But once you see the results, you’ll be more than satisfied.